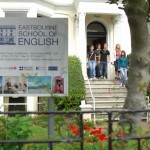 Eastbourne School of English was founded in 1936 and is a not-for-profit school. It is in the heart ofEastbourne, few minutes walk from the sea. It is characterised by a familiar and relaxing environment. With highly experienced and professional teachers. Maximum 12 students per class (summer time max 14). 20 classrooms, a self-access learning centre, a language laboratory, a student lounge with TV, DVD player, free Wi-Fi internet access, table tennis, pool table and other games, two lovely gardens, student bookshop and a library.